The Toy Library Federation of NZ is the national body to which individual toy libraries belong. We would like to thank the great people at the Toy Library Federation of NZ whose Lottery Grant helps us keep our toys up to date and in top order! Check out the website – they have lots of information about the importance of play and the benefits of joining your local toy library. You will also find contact details of other toy libraries within New Zealand – You may be able to borrow toys from a local library if you’re off on holiday in NZ! 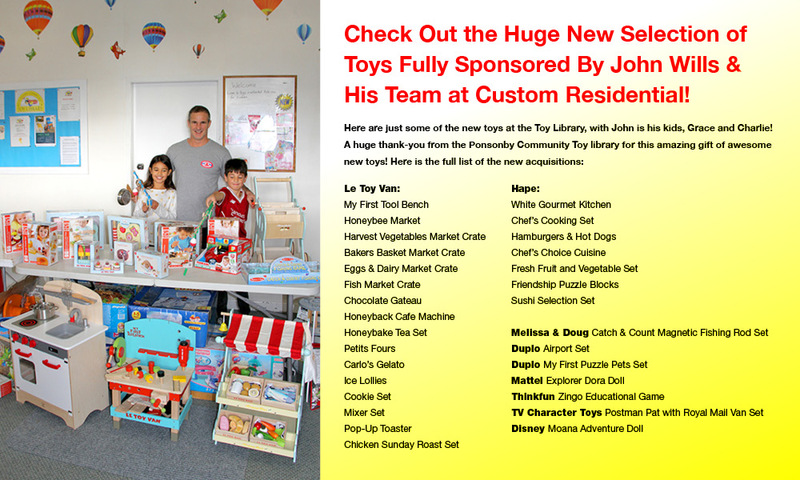 Custom Residential are thrilled to be able to support the Ponsonby Community Toy Library. As a local specialist real estate agency, we really appreciate the opportunity to get active with organisations in our community. Custom Residential exists to do a better job for a smaller number of clients. Our philosophy is best summed up as ‘Quality over Quantity.’ We’re not interested in the franchise mentality of processing a huge volume of property on a central auction house conveyor belt every month, nor can we get particularly excited by the one-size-fits-all routine. When a client chooses us, we feel the weight of responsibility to deliver. You will find yourself at the receiving end of the highest level of personalised service.